Russia’s armed forces recently completed their annual large-scale military exercises, this year named Vostok 2018 – or “East” 2018, thanks to their easterly location within the country. The government in Moscow heralded Vostok as the largest such set of exercises in nearly 40 years, claiming it surpassed even Zapad 1981 (“West” 1981). This year no fewer than 300,000 soldiers, up to 16,000 armoured vehicles, and 1,000 combat aircraft took part, according to the ministry of defence. As a result, Western coverage has tended to focus on the big numbers on display at the manoeuvre. But, rather than paying attention to how the Kremlin presents the pure numbers, we should pay attention to what the armed forces rehearsed – and how this could affect Europe. We should also note and consider the significance of the Chinese presence at Vostok 2018 and what this says about the future Russia-China relationship, and China’s future capabilities. East of the Urals, Vienna Document limitations do not apply – and so there is no obligation on Russia to report to NATO on the forces it has operating there. As a result, with the exception of a strategic missile exercise which is to follow later, all manoeuvres took place under the Vostok brand, rather than being technically scheduled as independent exercises. Official Russian comments are still vague on details, but combining them with Michael Kofman’s excellent blog on Vostok 2018 reveals some important insights. Rather than testing new equipment – as the armed forces chose to do in Zapad 2017, for example – their chosen purpose this time was to test the evolution of Russian command-and control procedures and tactics. They tried new airborne and naval assault tactics which aim to knock the enemy off guard by the speed and surprise moment of the offensive. Importantly, the exercises also left quite some freedom to individual commanders at various levels to fulfil the operative tasks set to them by the general staff. For the Russians this is a significant departure away from Soviet-style leadership techniques and towards Western-style mission command. It reflects the fundamental change that has taken place in Russian officers’ training implemented since the “new look” reforms of 2008. It also reflects the combat experience Russia gained in Syria and Ukraine, where they have had to learn to be less inflexible. 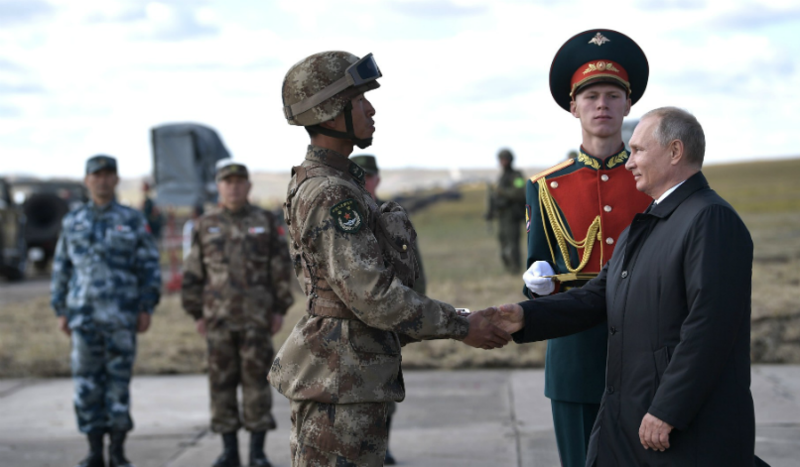 Importantly, this year – and for the first time – a Vostok exercise saw the participation of around 3,000 Chinese troops. Previous Russian-Chinese manoeuvres took place under the umbrella of the Shanghai Cooperation Organisation and predominantly featured ‘soft’ security threats like terrorism or subversion. In the past, the West and Russia have been united in their reluctance to invite the People’s Liberation Army (PLA) to observe combined arms manoeuvre warfare exercises. Why would the Chinese be so keen to see these? For many decades the PLA and its cadres – even more so than for its Russian counterpart – have been trained for a land-centric war that would be decided by the sheer mass of deployed Communist forces. Officers were trained to keep discipline above all, and warfare on a tactical and operative level was schematic and inflexible. But China increasingly knows that, if it wants to take on the United States in a 21st century air and naval war across the scattered Pacific island theatre, this kind of military leadership is ripe for disaster. As a result, the PLA has long pushed to participate in manoeuvres that train combined arms operations and that would give Chinese officers insights into Russia’s way of leading and conducting large operations. With Vostok 2018, China’s wish finally came true. Besides general staff officers, China sent a small detachment of armoured troops, air defence, and fighter bombers to participate in the manoeuvre. While not spectacular in terms of numbers, they covered fields in which the PLA has generally struggled to modernise its own doctrine and procedures: armoured warfare, integrated air defence, airspace management, and air-to-ground coordination. What should the West make of this? As a first step, Western powers need to cease their wishful thinking about a Russian-Chinese rivalry which somehow never quite emerges. China is by no means a threat to Russia. Moscow defines ‘security’ almost exclusively in terms of regime security, but nothing China does or may do in the future looks set to undermine the Kremlin’s rule. The West, however, is a threat to the Russian regime almost by its very existence. Furthermore, Russia knows that it cannot break the global pre-eminence of the United States without China acting as the battering-ram. However, while Russia needs China, China hardly needs Russia. It is unlikely to be a coincidence that Vostok 2018 took place at the same time as Vladimir Putin symbolically held the fourth Eastern Economic Forum in Vladivostok, where Xi Jinping enjoyed a key role in the programme. Putin would like to convince China to contribute to Russia’s industrial and technological modernisation. But so far there is little appetite in Beijing to engage economically in Russia or to help Russia out with defence modernisation. Beijing also does not want to be led into a confrontation with the West on Russia’s terms, or to sacrifice trade relations with the West for the sake of Russia (for this reason China has never particularly backed Russia’s moves in Ukraine). Viewed through this prism, Vostok 2018 was another confirmation of Russia’s inferior position vis-à-vis China. Still, Moscow has few other options than to play this role and hope Beijing’s challenge to Washington will, in time, provide it with the opportunity to revise the European order in its own favour. Vostok 2018’s manoeuvre area was divided into two fictional states: the blue ‘west state’ (i.e. NATO, which the Russian central military district played) and the red ‘east state’ (i.e. Russia, which the far eastern military district played). The blue state seems to have played the role of aggressor, beginning with subversive infiltration into the red state. After the red state fended off superior intruding air forces, the ‘red’ army counter-attacked and pushed its ‘defensive perimeter’ deep into the ‘blue’ state. This is quite consistent with Russian military thinking on operations against NATO. Furthermore, Vostok 2018’s final phase saw Russian forces carry out exercises in decontamination and fighting under nuclear, biological, and chemical attack conditions. Officially described as a “chemical spill” emergency disaster response exercise, video footage then showed classic field decontamination of armoured troops more suited to the battlefield use of weapons of mass destruction. Interestingly, the Northern Fleet was not used as a deep-strike means. In this manoeuvre, the fleet took part as the ‘blue’ fleet – i.e. simulating the US Navy – conducting multiple amphibious raids against the ‘red’ state. Russia has felt vulnerable in the far north for a long time, but this is the first time such contingencies have been addressed in a major manoeuvre. The Chinese contingent was based close to Tsugol combined arms training area, where air-to-ground coordination, airborne assault, and coordinated air-artillery-strikes were practised. Each year, Russia launches a series of formally independent manoeuvres that appear to rehearse different operational phases in one single war scenario. As such a Russian ‘manoeuvre season’ comprises: counter-insurgency operations; mobilisation and generation of forces; deployment of forces over distances; civil-military cooperation on logistics and infrastructure to facilitate these deployments; the ‘core’ manoeuvre training for offensive combined armed manoeuvre warfare; defensive operations to shield the flank of the main operation; exercises simulating deep-strike operations; and, finally, strategic missile forces exercises practising various stages of nuclear escalation. Different military districts or the national guard lead these exercises, coordinated by the general staff. This compartmentalisation reflects Russian wartime lines of command: military districts morphing into joint theatre commands each responsible for a war theatre. The mobilisation structure would see the war theatre, national guard, and various civilian agencies subordinated to the general staff. As a result, the general staff coordinates four to six large manoeuvres, thus simulating one major war. Taken together, 100,000 to 200,000 soldiers undertake exercises each year. Still, to comply with the limitations of the Vienna Document these are usually called separate exercises. For example, officially Zapad 2017 was only 12,700 men strong. But as Zapad took place, Russia held other manoeuvres in the Western and Southern military districts and the Northern Fleet command that altogether involved roughly 70,000 soldiers. All exercise scripts and scenarios fitted together as if they were one large exercise. In addition, before and after Zapad 2017, further exercises concluded the ‘manoeuvre season’. The preparatory phase of Vostok 2018 actually started on 20 August 2018, and many of the troops mobilised under the “Vostok” title were not used at the main combined arms manoeuvre shows in the five training areas east of the Urals. For this reason, “Vostok” looked in total more like the typical patchwork of exercises united by one major topic than one great manoeuvre.